"You must try the wanton mee near Platinum Mall guaranteed more than 1 bowl" - so read the message I received as I landed in Bangkok airport. Huh? The land that gives us tom yum, green curry and pad thai, and I'm to go look for wanton mee? Okaaayyy.... trusting the messenger, I verified this with the local guide and he kindly offers to take us there for lunch. And it was a good thing too since my texted directions consisted only of "turn right at hotel, walk towards McDonald's and turn into a side lane". Wah, very helpful. Do you know how many side lanes or soi there are? Already sweating buckets from the humidity and heat, I gamely trotted out of the hotel at noon with half a mind to turn back if this was a roadside stall. 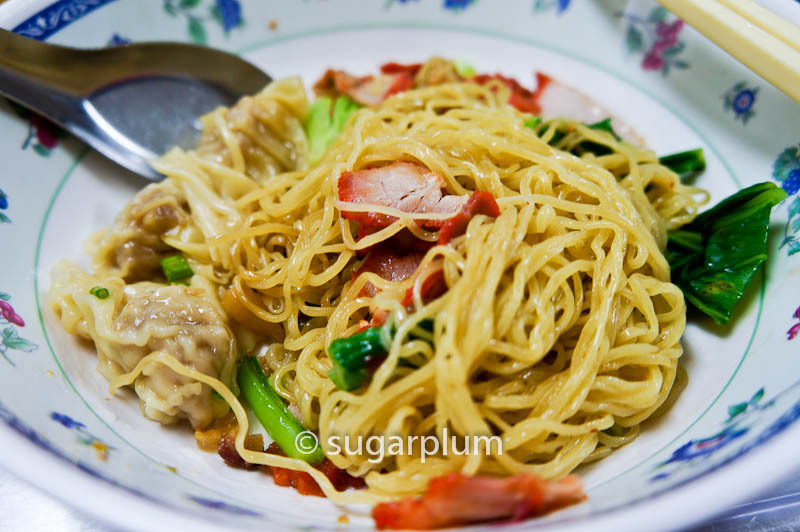 No way was I going to perch precariously on a stool under the scorching heat to have wanton noodles, no matter how good it's touted to be. Temperature check showed 35C. After weaving through the narrow sidewalks and navigating pedestrians, food stalls, clothes stalls, fake goods (the Thais are very entrepreneurial people, every inch of sidewalk is taken up by a stall), we see McDonald's just before Shibuya and turn right into Soi 19. The shop is somewhere in the middle of the lane. 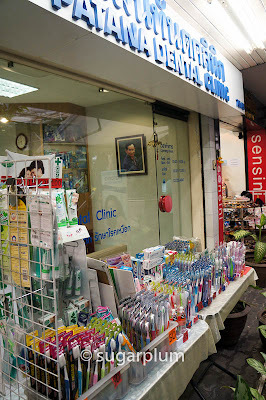 selling toothbrushes outside a dentist, enterprising no? There's a humongous pot of braised pork bubbling away on the left, and with the wanton soup boiling merrily on the right, the entire entrance is enveloped in a hazy steam mingled with the aromas rising lazily from the pots. But glory be, the shop proper is air-conditioned. Hurrah! 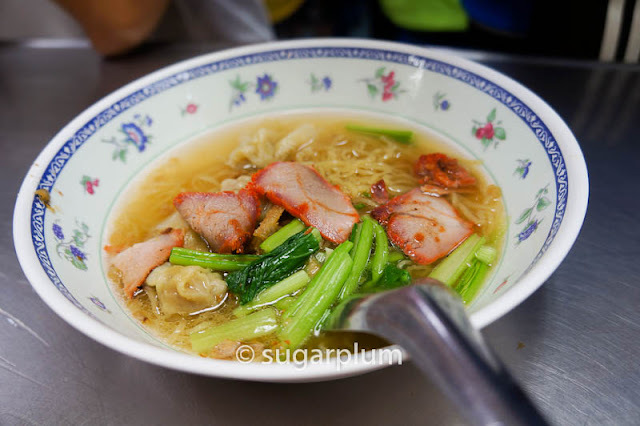 ﻿ The menu is simple enough - wanton noodles and braised pork (tau yu bak), in their usual permutations. The verdict? Ok, the wanton noodle is very good. More than good. Extremely good. The noodles are springy and very QQ. The tiny wantons are flavourful and the char siew was very tender - both wantons and char siew were strangely slightly sweet. 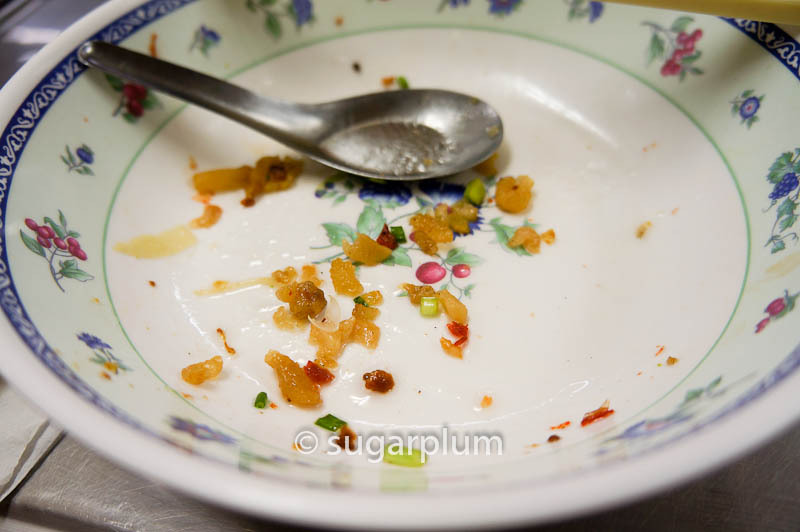 Don't be deceived by its simplicity - it was surprisingly rich and flavourful. But oh lardy lard lard - the secret to all that flavour and mouth feel; good old lard. I found the little bits of fried crunchy lard pieces at the bottom of my bowl. 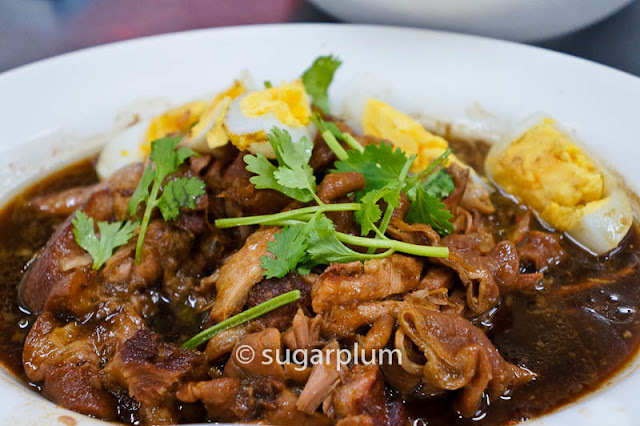 ﻿﻿ The braised pork is served with hard boiled egg and pickled mustard and you can request for intestines if you like. I've not had any bad braised pork in Bangkok before, and this wasn't any exception. 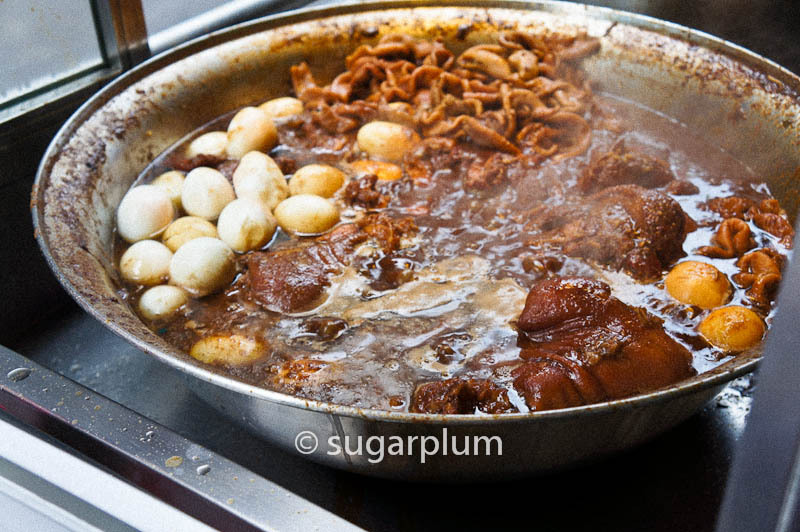 Pork braised until meltingly tender in soya sauce and spices, with all that fat and juices in the thick rich gravy. You can have this with rice to soak up all that lovely gravy for THB50. The wanton noodle is THB40 per bowl. ﻿ Very sinful indulgences, both dishes. If you have issues with saturated fats, then this obviously isn't going to work out. But I figured that if I walked through all the floors in Platinum Mall for the next 2 days, the exercise will make up for all the cholesterol and fat. Haha - bloody good excuse to shop too since Platinum Mall is a wholesale fashion mall. From Amari Watergate Hotel entrance, facing Platinum Mall, head right towards Shibuya mall and McDonald's (against traffic flow). 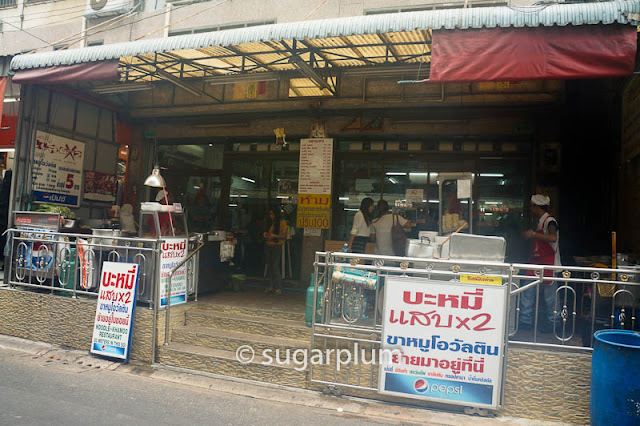 When you see McDonald's, turn right into Soi 19. The shop is somewhere down the middle of the lane. I couldn't make out the name in Thai even though the guide repeated it a few times.